From hurricanes to more than just one disastrous volcanic eruption, the beautiful Caribbean Island of Montserrat has survived a number of natural calamities. Split into the Exclusion Zone, Daytime Entry Zone and Safe Zone, Montserrat will continue to rise from the ashes, like a phoenix from the flames. With only two hotels, a smattering of tiny guesthouses, absolutely no stoplights, and volcanic rock scattered all over the roads, this tiny island is like heaven on earth. If your idea of vacationing in the Caribbean means visiting luxury shops, going to noisy casinos and gourmet restaurants, or strolling on long sandy beaches, then Montserrat is probably not the right place for you. With less than 15,000 permanent citizens and only a handful of ATMs, the Caribbean island of Montserrat is the epitome of ‘peace and calm’. There are no traffic signals, no international departmental stores, no four-lane roads, and no neon lights. The island’s slogan is “The Way the Caribbean used to be”. And, this time, the island’s marketers seem to have hit the nail right on the head! The official currency of Montserrat is the East Caribbean Dollar, but US dollars are accepted throughout the island. 1USD = 2.70EC$. Most major credit cards are widely accepted, and traveler’s checks as well as Canadian dollars are also accepted on the island. To boost tourism, the government of Montserrat decided to avoid noisy nightclubs and glitzy high-rise hotels. Instead, the island was to become an exact replica of ‘what the Caribbean used to be’. In the 1960s, the island launched a tourist venture, which was called ‘residential tourism’. In a nation where the majority of the inhabitants are black, Europeans and white North Americans were allowed to buy Montserrat real estate and settle down in a restricted area of the island as part-time or permanent residents. The outcome has been a clustering of prominent white foreigners living in large villas by the ocean, with servants and imported amenities. Another big economic factor was the setting up of an offshore medical school that served the North Americans. The island also became a regional media center, announcing and broadcasting news to the whole Antillean region. The economy is largely dependent on real estate, tourism, assembling industries, agriculture, and building construction. However, there is very little manufacturing activity here. Until the volcanic eruptions, there was an increasing tourist trade, and the whole island was building a productive cotton industry, even though it lacks the modern technology to take care of large volumes of cotton. Most tourists who visit the Caribbean Island of Montserrat are so taken in by its charming beauty and tranquility, that they buy their very own villas on the island. Other visitors prefer to return and lease or rent private homes every year. Whatever you prefer, be it building, buying, or renting, owning Montserrat real estate will always ensure that you have plenty of wonderful memories. Ever since Soufriere erupted, the price of real estate on the island has been postively affected, and now there are a large number of desirable properties that are available at any time, and at competitive prices. If you are planning on building your own home on this beautiful Caribbean island, then there are several qualified architects and very competent building contractors, who can build your very own dream house. Buying Montserrat real estate as a non-citizen is a hassle free and straightforward procedure. The government of Montserrat welcomes ‘expat’ investments, which makes it considerably easy to buy property here. All Montserrat real estate transactions are conducted in U.S. dollars, and you will get a title for your property or a Freehold Land Certificate once the deal is closed. Most houses sold are completely decorated or furnished, and upon purchase you can move in almost immediately. $365,000, which is a steal for Caribbean real estate. A six-bedroom luxury villa with brilliant views and a surrounding patio would start at $499,000. The next time you consider visiting this beautiful Caribbean Island, think about investing in the real estate here. Nowhere else in the Caribbean will you get such amazingly affordable property. Montserrat has many leisure activities to offer tourists. So, if you’re planning on visiting this beautiful island you might be interested in the hiking opportunities that Montserrat has to offer. From hiking tours in the northern tip of this Caribbean Island to guided walks, the Montserrat Forest Rangers provide a wide range of hiking opportunities. Popular hiking trails are Runaway Ghaut, the Silver Hills trail, Cot trail, and the Center Hills trail. Trained guides are available to give the tourists information about the unique flora and fauna of the island. If you’re interested in volcano viewing, then there are quite a few day tours that are available. Professional guides will take you to various safe vantage points where you can observe the Soufriere Hills Volcano. You can also visit the Montserrat Volcano Observatory. For an aerial view of the volcano, there are Caribbean helicopters that also offer tours around the volcano. If you are into water sports, then most of the villas on the island have their own swimming pools. 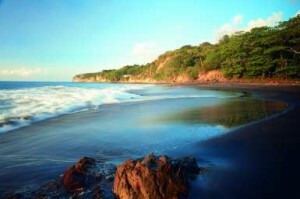 Unlike most Caribbean islands, the beaches in Montserrat are made of black volcanic sand. The waters surrounding the island are excellent for snorkeling and scuba diving. Diving equipment can be rented or purchased on the island, and snorkeling equipment can be taken from your resort. Professional agents and even villa owners can arrange proper instructions. Specialist operators or even hotels can organize sea-fishing trips. When it comes to sports activities on the island, cricket is by far the most popular game, and matches are generally played from the months of February to June. There are a few small nightclubs and a smattering of roadside bars, which are also known as Òrum shopsÓ, wherein people mingle informally to just relax or ‘ÒlimeÓ’ over a couple of drinks, or perhaps play a lively game of dominoes, especially on the weekends. 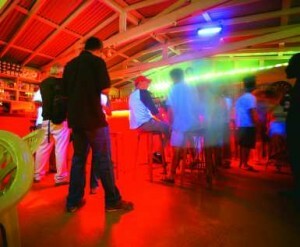 With the limited nightlife, most clubs have no closing time and remain open till dawn. The summer and winter temperatures average anywhere between 85° and 95° Fahrenheit. With constant breezes blowing in from the mountains and seas, the temperatures in Montserrat are well-moderated. Annual rainfall is around 50-80 inches and is very well distributed throughout the year. The wet season starts in July and goes until November. The Caribbean island of Montserrat, with its lush green mountains, is an island that is roughly 40 square miles, and lies in the eastern chain of the Caribbean islands, which are around 30 miles southwest of Antigua. This beautiful, pear-shaped island is about 12 miles long and 8 miles wide. However, it has been expanding because of the volcanic activity that is taking place in the southern end of the island. It lies about 1,150 miles north of the equator. This lovely island rises in a dramatic series of mountain slopes to the highest point, which is 3,000 feet. The main international airport is the Gerald’s International Airport. WinAir is operated daily from Montserrat to the Caribbean islands of St. Maarten and Antigua. There is a heliport in Gerald’s Bottom at the northern end of the island. The Montserrat Aviation Services and the Carib Aviation operate helicopter services from Montserrat to Antigua five days a week. There is a ferry service that operates daily between Montserrat, Little Bay, Heritage Quay, and Antigua. Furthermore, yachts can also be chartered for a sightseeing tour. The main harbor is in Little Bay. Traffic in Montserrat drives on the left. The road networks are quite impressive, but driving can be a tad dicey for those not familiar with driving on winding mountain roads. For sightseeing, minibuses are widely available all over the island. There is bus service between the town and the villages. If you wish to travel by taxi, there are standard rates for regular journeys. There are plenty of car rental companies at Little Bay Port and the heliport. Very little has been recorded about the early history of Montserrat. The aboriginal inhabitants were probably made up of Arawaks who were then killed by the Carib Indians by the time Christopher Columbus arrived in 1494. The Carib Indians left Montserrat by the 17th century, but kept raiding it regularly. They called the island “Alliouagana”, which means ‘Land of the Prickle Bush’, after the aloe vera plant. The Caribbean Island of Montserrat is often called “The Emerald Isle of the West” because of the Irish who featured prominently in its history. In 1632, a British contingent from the main colony of Saint Kitts first settled in Montserrat. Even though the first colonists were the Irish and the English, Montserrat soon became a place of refuge for Irish Catholics fleeing religious persecution. The Irish first arrived as servants, and then later worked as slaves in the plantations. Irish culture is largely visible all over the Caribbean Island of Montserrat. Some people claim that the present day Montserratians still have an Irish lilt, but such linguistic evidence is not convincing. Irish names are common, and outwardly the residents of Montserrat seem a lot ‘lighter’ than the inhabitants in most of the other Afro-Caribbean islands. However, most residents appear to have African heritage. In June 1995, Montserrat’s active volcano erupted, which completely devastated the island. Before this, the Caribbean Island of Montserrat was the hottest destination for movie stars, jet setters, and anyone else who wanted to live in peace and quiet. 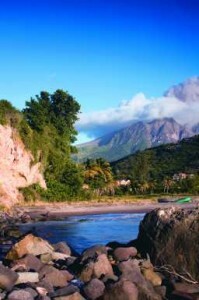 Montserrat continues to be a cultural blend of African, Caribbean, and Irish heritage. Saint Patrick’s Day is a national holiday here. The flag of Montserrat depicts Irish folk women playing the harp. The national meal, which is called ‘goat water’, also has an Irish history, and is a stew made of mutton and kidney with rum and cloves. Recently, Montserrat decided to throw the Calabash Festival, which is an explosion of culture, and occurs in July every year. 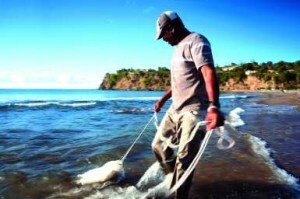 It sheds light on what the Montserrat culture exactly is. This festival is named after the vegetable or fruit that locals used to make musical instruments and utensils with. The festival shows the eclectic blend of the cultures on the island, with its rich artistic and musical influences, as well as its strong African and Irish roots.